For the 2017-18 Tracker, we asked our key contacts to provide information about your organisation in addition to the student data you are gathering through the tracker. This blog post explains how we developed those questions, what they are, and something of how we hope to use them to understand the student digital experience better. In short, we’re interested in what decisions at organisational level are related to the quality of the student digital experience. We asked organisational leads to answer at least four of the questions. We thought it was a big ask to provide all ten items of information and we didn’t want that to be a barrier to joining the Tracker pilot. In fact a large majority gave us ten responses. Hopefully that means we’re asking the right questions and the answers are useful at an organisational level. Across organisations of course there is even more value in comparing and summarising responses, and our next blog post will review what we have learned so far – anonymously of course. When we developed these questions, we had in mind that we would like to include teaching staff as well. There are many projects and organisational practices that take a 360 degree perspective on an issue, and we felt this was no exception. 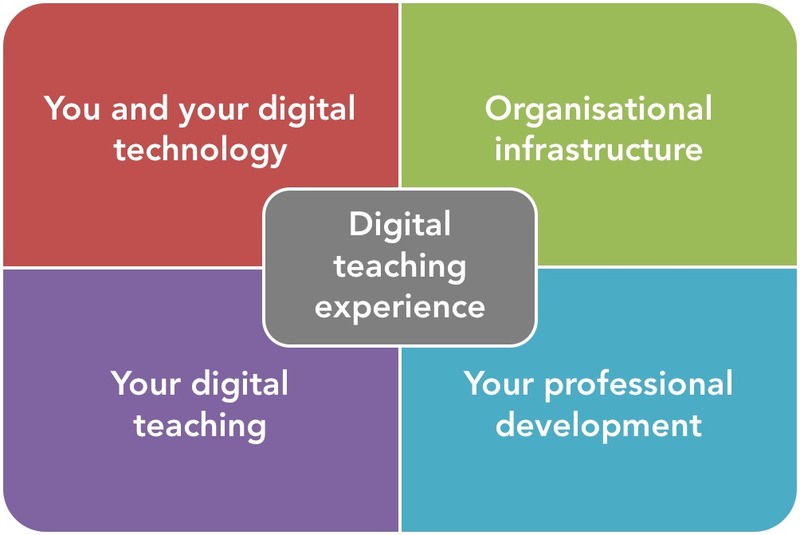 When it comes to the digital learning experience, teaching staff are in an intermediate position between the organisation and its students. 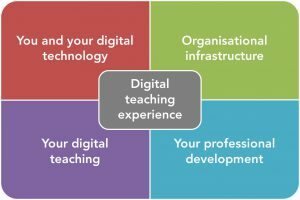 They support many aspects of the student experience – and we ask students for example about how they find their lecturers’ use of the VLE, and what they like/dislike about digital teaching on their course. But teaching staff also have their own experiences of organisational support, infrastructure and culture. These experiences add richness to the picture we can gain from students and from the organisational overview. We also feel it is important that staff are fully involved in the tracker project, and see it as an opportunity to improve digital provision and support for everyone. A draft set of staff questions is now available. 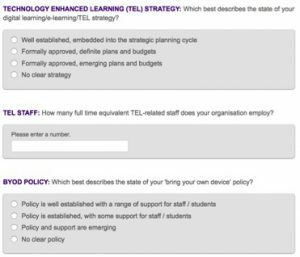 This is mapped to the student questions and the organisational questions – but of course there is always room for improvement. We are looking for constructive feedback from teaching staff and for everyone involved in supporting staff and students to improve digital learning. We’ll also be asking some organisations involved in our current Tracker pilot whether they would be willing to help trial the staff survey alongside the proven survey for students. We’re asking you to tell us what you think of the draft questions: are they right for your sector and staff, and will the answers be actionable in your organisation? This is a chance to make a real difference to the Tracker project. The draft questions for teaching staff can be viewed in BOS here. You can provide your own comments and feedback on an open googledoc here. Expressions of interest in trialling the staff tracker will be asked for via our email community of practice.